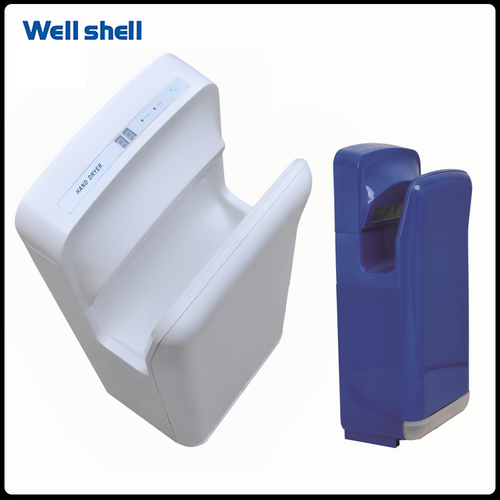 WELL SHELL hand dryer Electric, hand dryer, Jet hand dryer, Hand Dryer China, Automatic hand dryer are innovative hygienic hand dryer that is designed to be environmentally friendly and uses less energy than other conventional dryers. We just have a test to compare the cost with paper towels and found that the cost to dryer 20 pairs of hands for less than the cost of one paper towel. this hand dryer reduce the risk the spread of bacteria. Not only the stainless steel hand dryer use less electricity, which reduce the carbon footprint at less than production of paper towel. We have a common goal to reduce the carbon footprint, try to save on costs and wishing to become green. Let's do it !